If you’re ready for the ultimate dinner that has tons of flavor and NO sauce, you’ve got to make these smoked bacon wrapped pork chops! 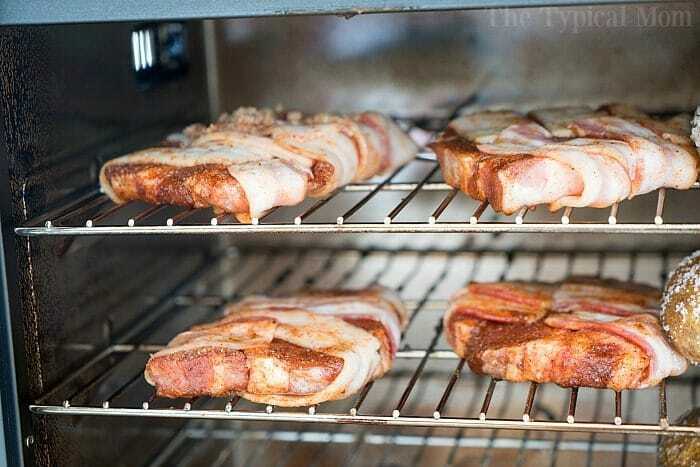 Of course you don’t have to have an electric smoker to make smoked bacon wrapped pork chops, any smoker will do. This is similar to the one we have just for reference. First we made this Instant Pot pulled pork recipe with a pork roast which was amazing and then we moved on to smoking our pig. I will say that not everything my husband cooks turns out perfect. BUT this and the smoked baked potatoes were perfection!!! Here’s a picture of when the bacon wrapped pork chops were prepped. 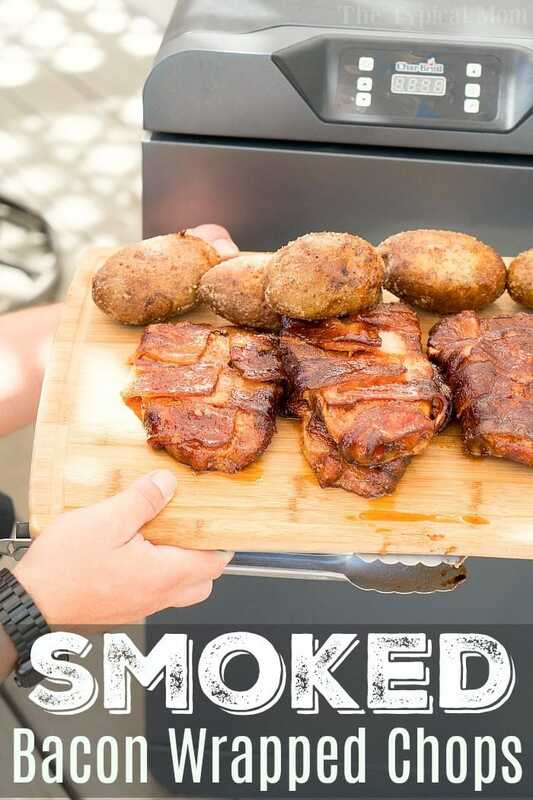 If you love using your smoker too here are a few other smoker recipes that we love and others rave about! These smoked bacon wrapped pork chops are Amazing! 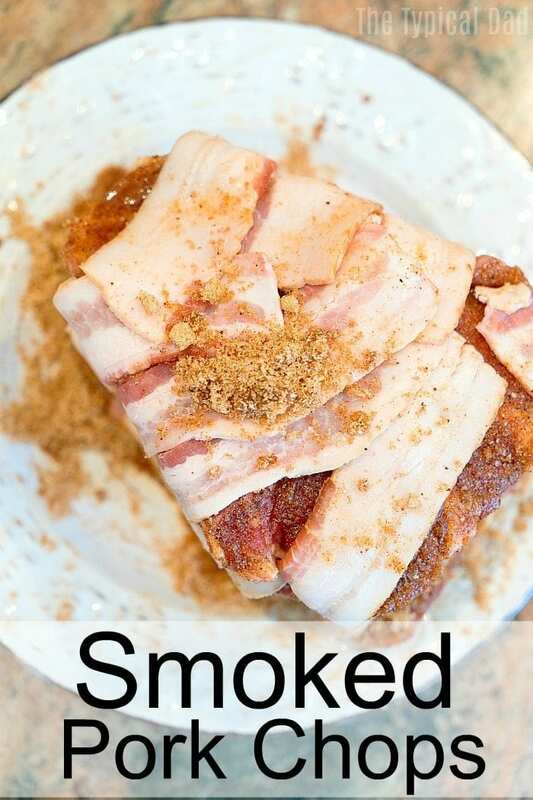 If you are obsessed with this cut of meat as we are you can also try this easy baked pork chops recipe and smoked pork steaks some other night! To make more in your smoker you’ll need this meat smoking chart to know what temp and how long to cook each meat. If your smoker doesn’t have a built in digital thermometer you’ll want that too. Note: Always ensure internal temp of pork is at least 145 degrees. Way to properly check temp is to remove from heat, then test. If it isn’t ready continue cooking until it’s safe to consume. Then allow to sit after removing from smoker for 15 minutes before slicing to keep juicy. 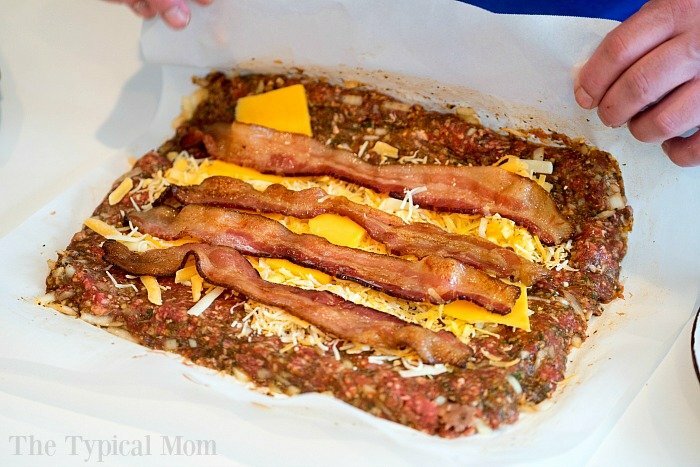 If you’re ready to try something else amazing after this try our bacon and cheese stuffed smoked meatloaf! Now this could be baked in your oven at 350 degrees until golden brown on top but NO. If you’re like we are and a bit obsessed with smoking meats you know that it’s gotta’ get on that grill. 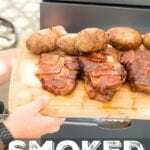 I will tell you that these easy smoker recipes are a few of our most popular. I am sure you can tell why! Just smother with some barbecue sauce minutes before serving and I guarantee you’ll be the hero for making either one of these. Here’s the printable recipe for our dry pork rub and smoked bacon wrapped pork chops. If you're ready for the ultimate dinner that has tons of flavor and NO sauce needed you've got to make these smoked bacon wrapped pork chops tonight! Mix all spices together in a bowl well. Massage the dry rub on each pork chop, on the bottom and top. Wrap 4 strips of bacon on each pork chop width wise. Fill wood chip container, put into smoker and put pork chops on top racks. Close door and cook at 275 degrees for 90 minutes (timing may need to be adjusted depending on how thick your chops and bacon are, I would check after 70 minutes). Allow to rest when done on counter for at least 5 minutes so juices stay in meat. This was the very first thing I made with my new electric smoker. It is, by far, the best thing I have ever cooked, with my friends and family loving how good, moist, and flavorful these came out. My brother-in-law went out the next day after eating these and purchased a smoker. Quick and easy for those days when you don’t have the time.